So, the printer has a door, which has a catch, which broke. 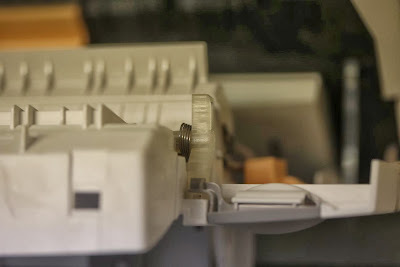 For a long time we have had tape over it, but that has to be removed if ever there is a paper jam, and tends to come undone anyway, it is a pain. Now I have a 3D printer... 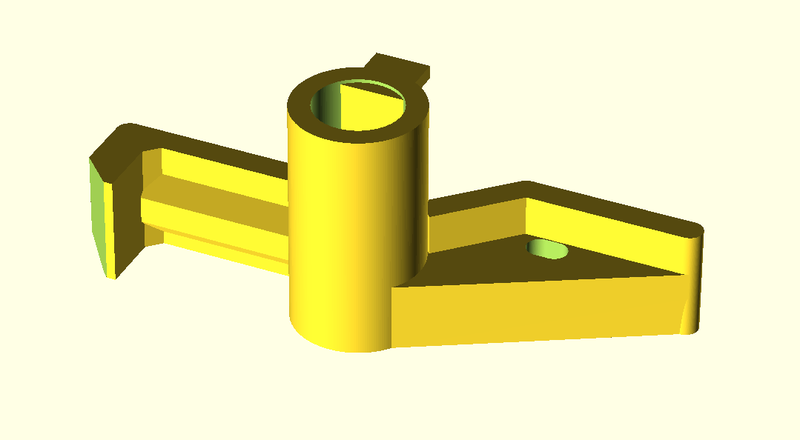 So a bit of work on openscad. Original (broken) on left, new one on right. Update: I will find my micrometer, but I bet the metal rod was not 6mm but was 1/4", which explains why I had to make the hole larger, eventually 6.4mm (1/4" is 6.35mm). So sounds like the printing is in fact spot on. LOL, we tried that first - it did not work. That's quite impressive. How long did it take to measure up the original and then design the replacement in the CAD program? Not sure, maybe an a hour or so. I then had to make a few attempts, at it looks like the print had a fraction of a mm bleed which meant an exact 6mm hole was too tight for the 6mm metal rod. But I am learning.